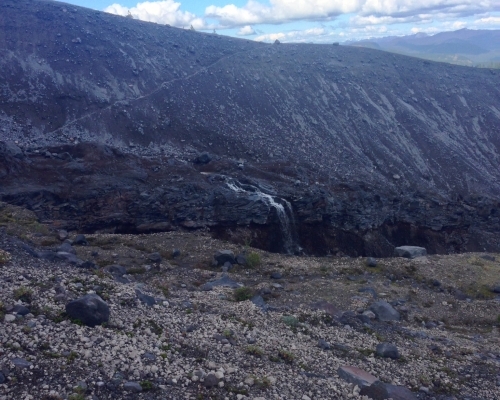 After the eruption of 1980, the landscape around Mt. St. Helens was altered in a dramatic way. What remained was a schizophrenic medley of volcanic terrain; a personification of the mixed emotions that backpacker dreams are made of. The best part? There is a trail that goes right through it. Like Mt. 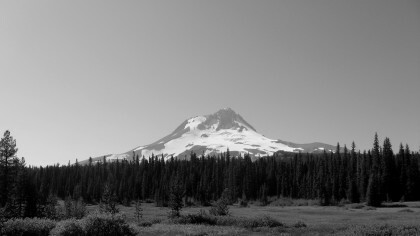 Hood’s Timberline trail, Mt. 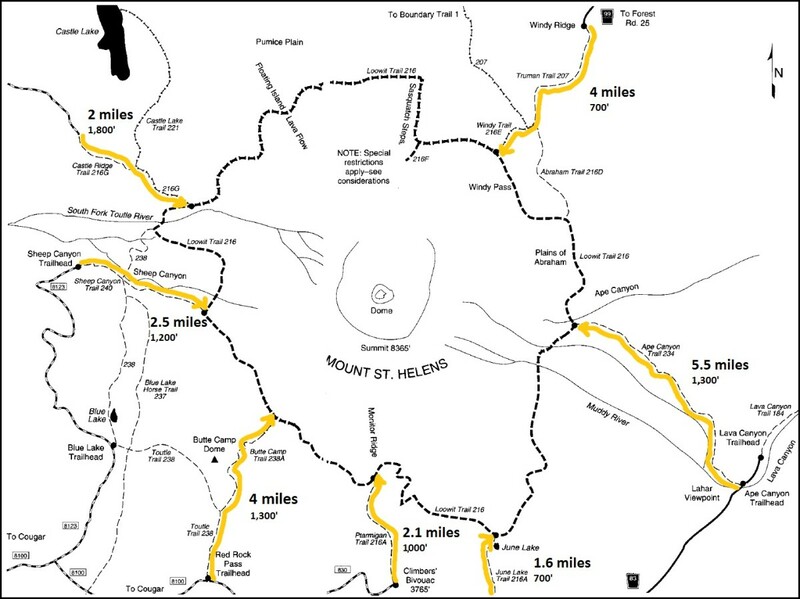 Adams’ Round-the-mountain trail, and Mt. 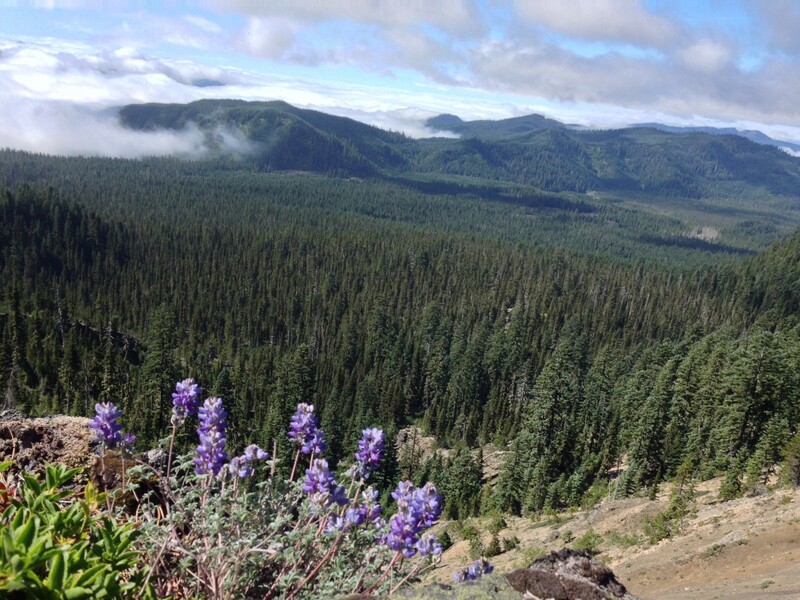 Rainer’s Wonderland trail – Mt. 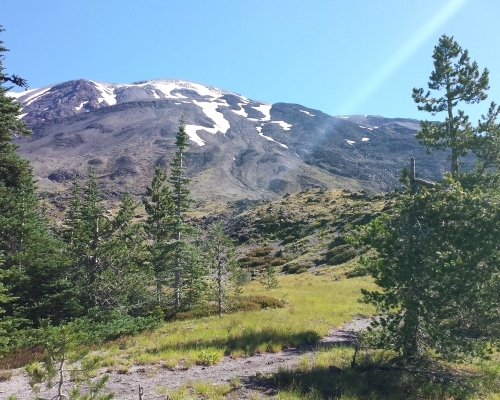 St. Helens also has a 28 mile path which circumnavigates the base. 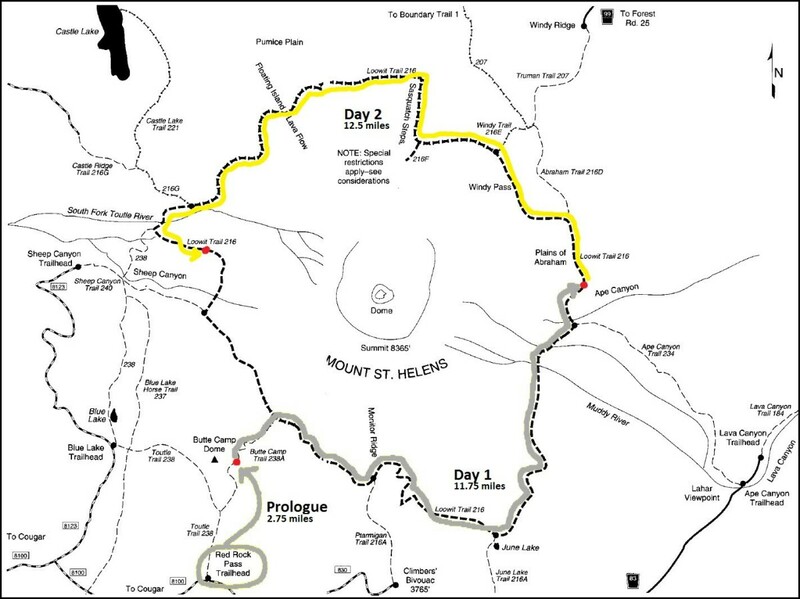 No other trail in the area is able to incorporate each unique element of Mt. St. Helens quite like this. 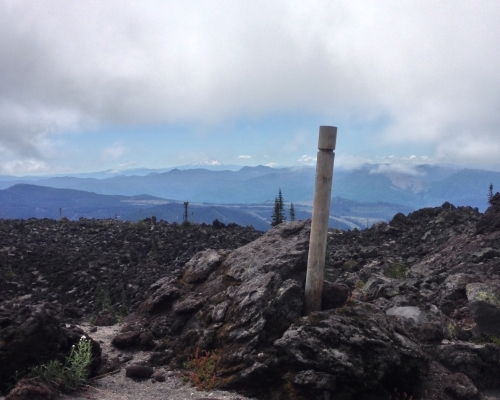 It gets use by day hikers, backpackers, runners, and events like the Volcanic 50k. Yes – People run around this mountain in less than a day. The goal: 36 miles in 3 days; backpack the loop around Mt. St. Helens known as Loowit Trail. It’s important to understand that one does not simply drive up to Loowit trail. 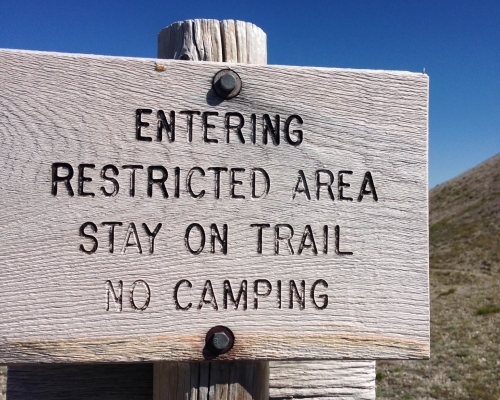 It does not have a trailhead and there is no designated starting point. Instead, hikers must use any one of the seven inlet trails that intersect with it. June Lake Trail presents itself as the shortest and easiest route to Loowit at 1.6 miles and 700′ of elevation gain. 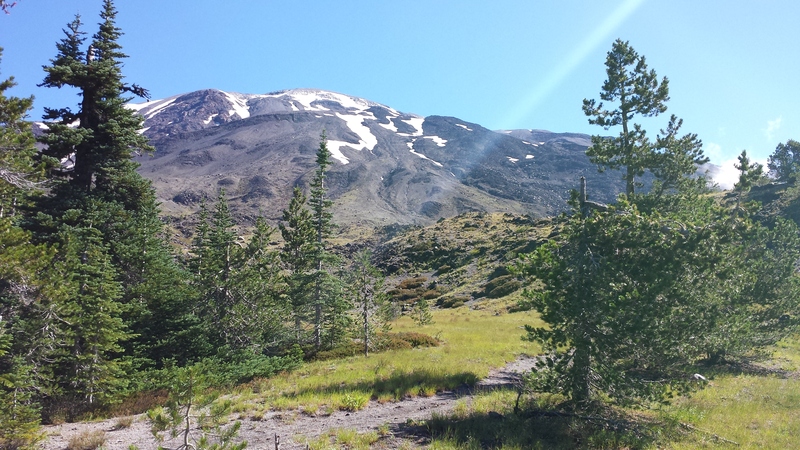 Ptarmigan Trail from Climbers’ Bivouac is a common Mt. 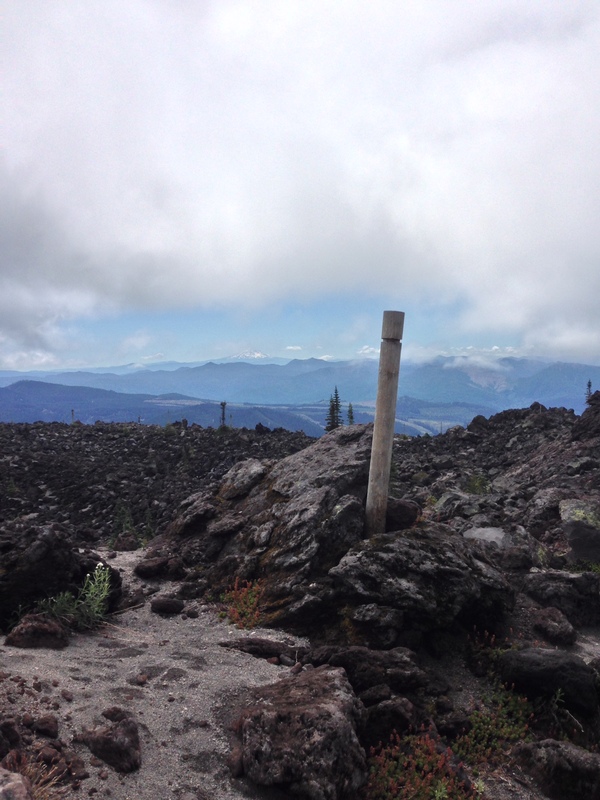 St. Helens summit hiking route and intersects with Loowit Trail at 2.1 miles. However, we wanted something more adventurous. A week before our scheduled departure date, I scoped out a potential starting point called Red Rock Pass Trailhead. The area looked promising due to a steady fresh water supply close to the Loowit Trail intersection and the availability of primitive camping spaces. I was not disappointed. Ultimately, this was the route we decided to take which meant an additional 8 miles, bringing the total mileage of our trip to 36. 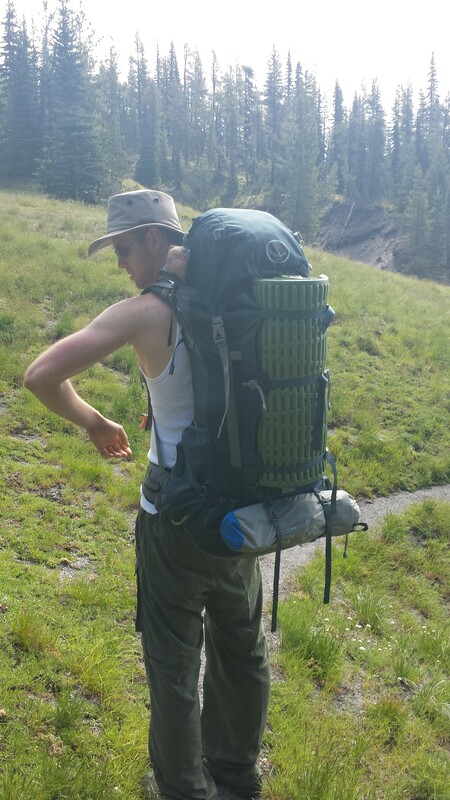 My backpack of choice was the Osprey Aether 85; a large, dependable pack that fit my long torso. The whole package offers an uncompromising level of utility. With 85 liters of internal space and 6 exterior pockets you can carry just about everything you would ever want with you. Weighing in at nearly 5 pounds, this is not the lightest backpack available. However, it holds true to the Osprey name and uses tough, durable materials. For my feet, I opted for a pair of grippy, trail shoes. The GoLite XT Comp was an outdoor cross training shoe designed to be lightweight and durable. Most impressive were the knobby, rubber bits that functioned as tread. On large rocks or uneven surfaces they gripped significantly better than any pair of running shoes or hiking boots that I had owned previously. The two downsides of this shoe were lack of water resistance and ankle support, however after 36 miles the shoes looked worse than my feet. My shelter of choice for the duration of the trip was a Hennessy Explorer Deluxe Asymmetrical hammock. As long as you have two tall, sturdy mounting points you can set up camp regardless of how rugged the terrain beneath it looks. It’s lightweight (3 lbs) and fairly compact (5” x 8” x 12”). The best part was the quality of sleep that I was able to achieve in this compared to a tent. The asymmetrical position allows you to sleep at a nearly flat angle. And, yes, it also rocks you gently to sleep. A sleeping pad is still required to insulate your underside. I used a Thermarest RidgeRest SOLite paired with a Slumberjack Ultimate +20 degree sleeping bag. Gear and food would need to be lightweight, multipurpose, and adaptable for the different environments we would encounter. 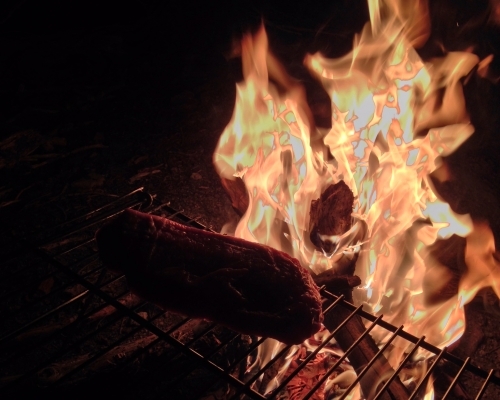 Rib eye steak over an open campfire. We made it a priority to pack foods that were over the 100 calorie per ounce rule that most backpackers live by. These were foods like fruit/nut trail mixes, freeze dried meals, peanut butter, nutella, Snickers, and protein bars. Our pace would be constant and the elevation varied. Projected energy requirements would be between 4,000 – 6,000 calories per day per person. Over the course of 3 days we would burn somewhere in the neighborhood of 15,000 calories. In comparison, the average human has a daily caloric requirement of 2,000 in order to maintain their current weight. 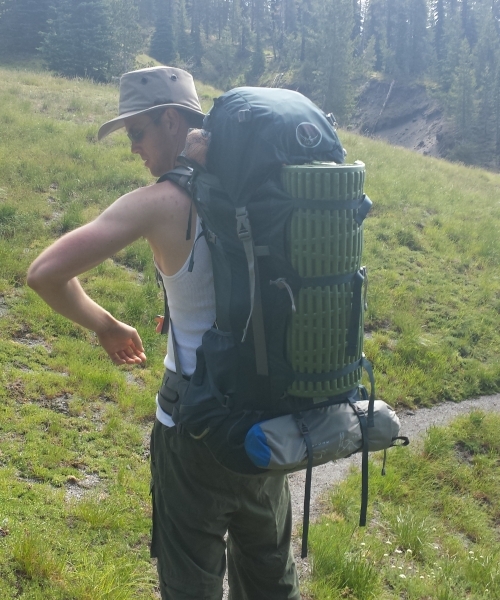 I started with a full 2-liter hydration bladder which was utilized as a backup water source. My primary container was a 750-milliliter Camelbak Groove water bottle which I refilled every time we encountered a water source near the trail. A LifeStraw water purifier was used every time I drank from natural water sources in order to avoid bacteria and filter out any debris. “Do you have the gear for a trip like that?” I asked my would-be hiking partner (we’ll call him Cheval) with a look of skeptical intrigue. “Where should we start?” Cheval responded eagerly with a kind of insane twinkle that only a brand new Gregory backpack will put in your eye. “You didn’t answer the question,” I stated blandly. “Okay, slow down – I’m in. But you won’t need that 9mm, it’s just going to be dead weight.” As I said this he looked wistfully at the holstered weapon on his hip. “Let’s take a look at this map,” I prompted encouragingly. 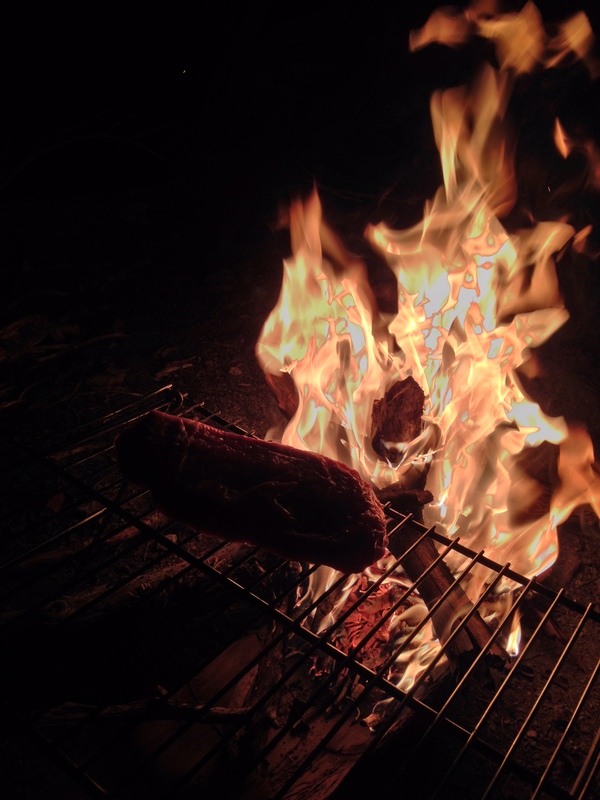 “What are you eating?” I asked Cheval, as I plopped down my signature “first night in the woods” rib eye steak over a hot bed of coals laid out neatly in the sand. 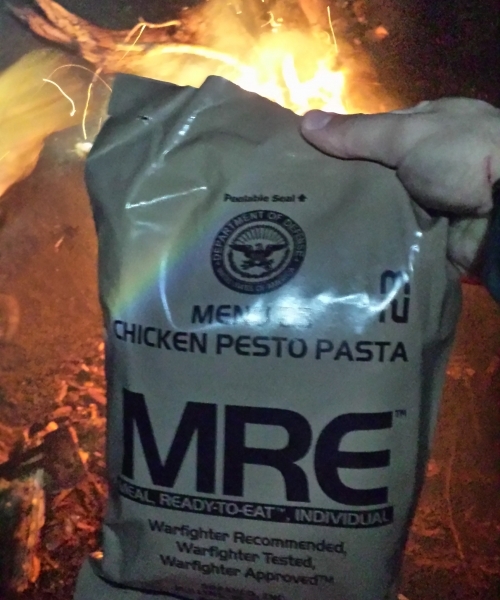 “MRE, brah,” he muttered. It seemed convenient and portable enough. The “Warfighter Recommended” print had a satisfying sound to it and I was tempted by the apple crisp bar that had been included. However, a look of discontent emerged on Cheval’s face as he began to consume his Department of Defense dinner. “You going to make it, solider?” I inquired of the crestfallen Cheval. He tossed the apple crisp at me and I tore open the wrapper. Staring back at me was a gray bar roughly the same color as the packaging. Preparing for the worst, I bit in. “Delicious!” I exclaimed with an MRE-eating grin. Cheval looked at me unamused and walked back to his tent after throwing the rest of his meal into the fire. It was a warm summer evening at the end July. With only a few hours of daylight, our goal was a quick 2.75 mile push from the trailhead to Butte Camp. After triple checking that the Subaru had been locked, we climbed up the steep steps of the trailhead and were immediately greeted with an unobstructed view of the mountain. It seemed like a good omen to have the mountain beaming down warmly upon us in the early stages of dusk at the start of our journey. 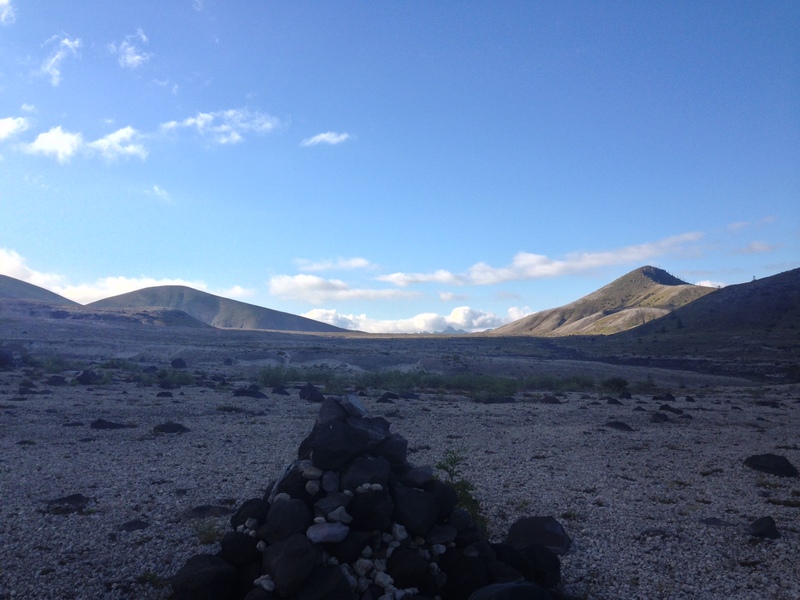 After some pre-trail pack adjustments, we proceeded north through the lava rock fields. 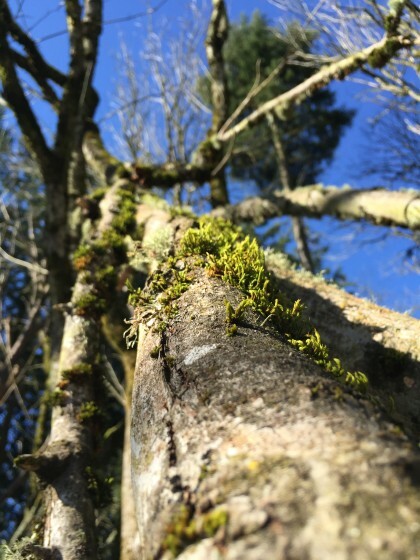 Uneventfully, we climbed upwards through the fresh, forested scenery of Toutle trail. We made excellent time and, before the sun had set, we had reached Butte Camp. For a primitive campsite it has everything you need. It has open spots for tents and sturdy trees for hammocks. A stream runs through the area providing plenty of fresh water for cooking and drinking. Walk a few yards away and bathroom privacy can be found in the dense forest. Here we would rest, recharge, and start early the next day. I awoke to bright sunlight streaming in through the crack just below the rain fly that hung gently over my hammock. “You slept in. What happened to ‘get up and hit the trail early? '” grumbled the disembodied voice of Cheval. “Nature wooed me with its peaceful undertones,” I remarked to the trees. All I heard were obscenities in response, so I decided to get up and make some breakfast. “Do you think we’ll still make it to Windy Ridge to set up camp for tonight?” I asked through a mouthful of instant oatmeal. Heading east on Loowit Trail. “Probably – I mean, with our gear setup we could probably complete Loowit Trail today,” he replied with a kind of Bear Grylls stoicism as he stood with his back to the morning sun. “Have you been drinking your own pee? Don’t be ridiculous,” I said in an exasperated tone. 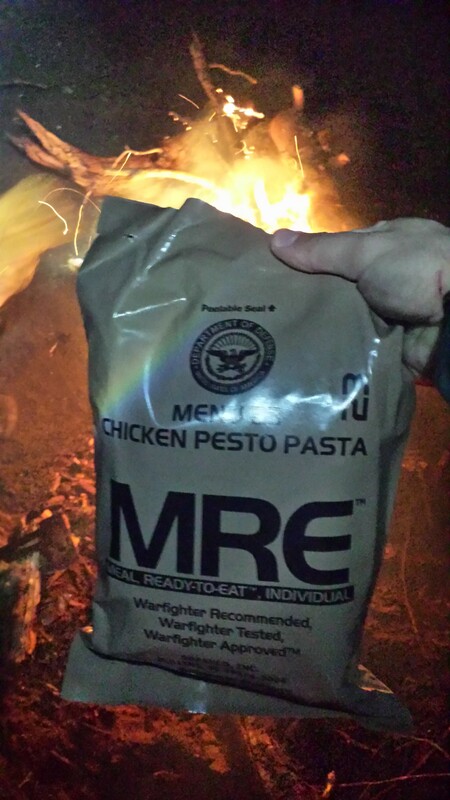 “Nope, just MRE electrolyte mix,” he replied with a grin. We made quick work of the 1.25 miles of trail up the hill to Loowit. Soon we were at the junction looking east. There was no anticipation, no stress, no remorse; only the trail now. In between admiring the routine appearances made by Mt. Adams and Mt. Hood, I had been on the lookout for a decent walking stick. Unlike Cheval, I had not brought trekking poles and, as the miles began to accumulate, I found that having some kind of support helped significantly. At the time, I didn’t understand how advantageous having a pair of trekking poles could be. As it turns out, trekking poles can increase your average speed and reduce compressive force on the knees by up to 25 percent, which translates to an improved hiking experience. 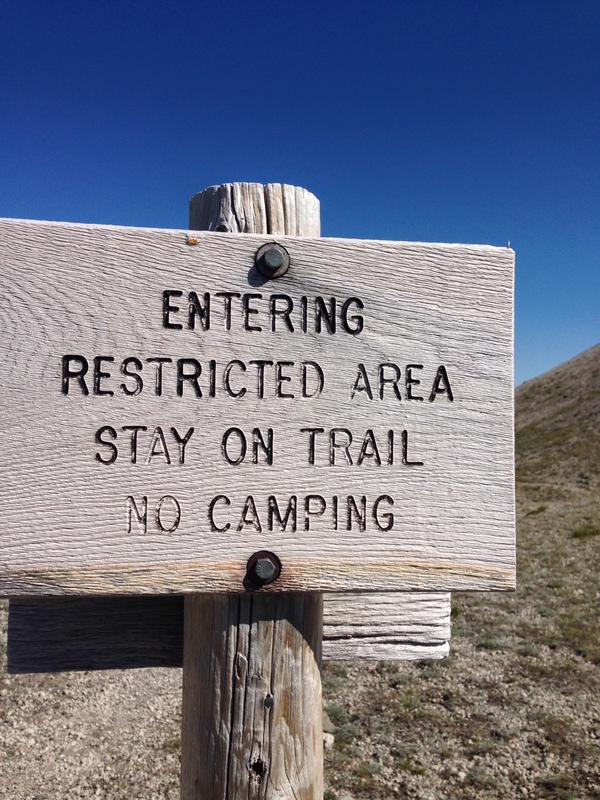 As long as you’re on the lookout for these you’ll make it through the sections where the trail is less obvious. “We’ve only gone about 4 miles…” he replied, breathing heavily and looking cautiously over the massive piles of rock that lay ahead. “You have a GPS, just check that,” I instigated. “It wouldn’t do any good to see how many miles we’ve gone because we haven’t arrived at our destination yet,” he noted. I pondered this sagely statement and continued on. The intersection of the trail at June Lake was the turning point that day. The walking stick that I had found early on had snapped in half after becoming lodged in a crevice between two human sized boulders. Without the physical support of a walking stick, the remaining miles that day felt laborious. 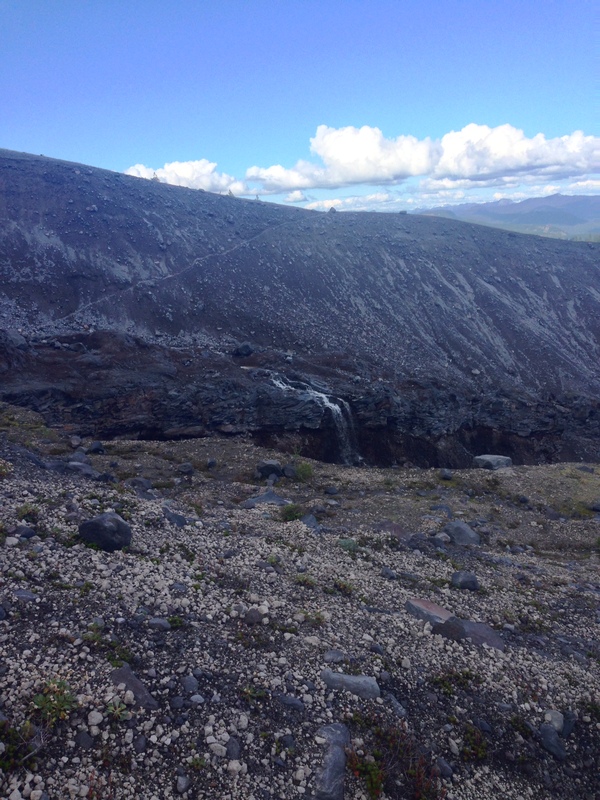 What remained were 8 miles of lava rock, steep gullies, beautiful wild flowers, and swarms of crickets. We did not come across any perilous water crossings, but it was easy to envision some of these washouts being difficult to ford in the spring. The push north to Ape Canyon borrowed on our spare energy reserves and taxed our mental fortitude to continue on. It was around this point that the idea began to emerge that we wouldn’t be able to complete our objective; that we would need to turn back. After each new valley descent and climb back up the other side, we hoped it would be the last but it continued on this way for miles. It felt like extended interval training on a long, drawn out timeline in which nature was the instructor and we were its gullible pupils. The beauty of the Lahar is a signature memory for me when I think back to the southeast side of the trail. 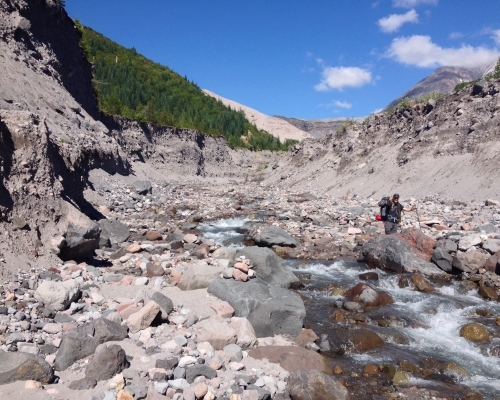 There is a distinct division between the natural beauty of the forest and the gray encroachment of the mudflows carrying rock and ash away from the mountain. This was all tempered by the droplets of sweat that we left in our wake as we pushed onward. “I thought we would be able to cover more distance in less time. We’re carrying too much weight, and if the north side of the mountain has the same type of terrain as this…” Cheval responded, his pessimism evident. “A solid meal and a good nights rest will do wonders,” I replied encouragingly. “If we have cell service, I’m putting in a call so that we’ll have a pickup from Windy Ridge or Ape Canyon trailhead. If we’ve got roughly another 20+ miles to go we have to consider worst case scenarios in case we can’t make it,” he warned. Several miles later we made it to a ridge overlooking Ape Canyon. With Mt. 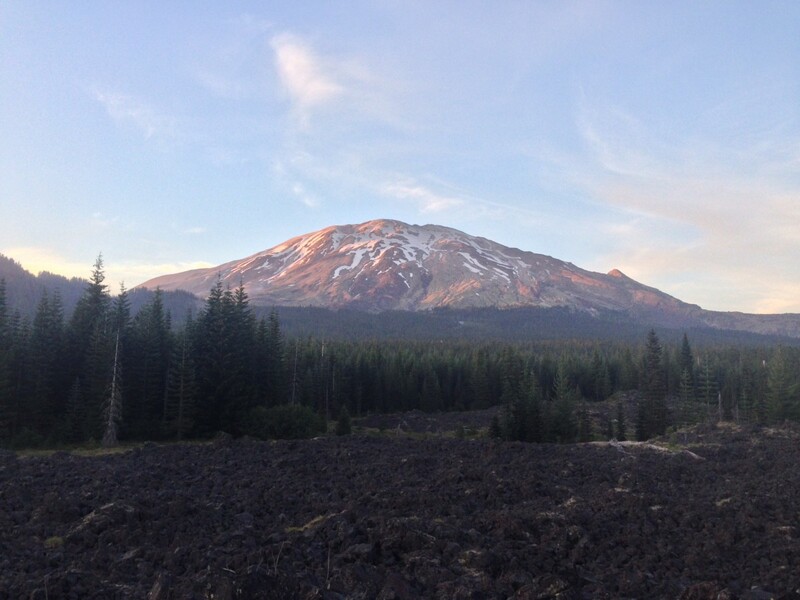 St. Helens in our backyard and Mt. Adams on our front lawn, the magnificence of it all was breathtaking. This seemed to ease his worries slightly, but after walking a quarter of a mile to the base of the mountain to gather some fresh water he found cell service and put in a call. “They’ll be available if we need it, but I’ll wait until we make it through Windy Pass tomorrow to decide,” he said as we walked back to camp. When we finally linked up that morning it became apparent that language had devolved in to a series of primitive grunts and hand gestures. At some point while packing we regained our ability to speak and I made a startling discovery. “There was a stream of water next to our campsite the entire time!” I exclaimed wildly as I stood near the edge of the ridge looking out over Ape Canyon. The water trickled down the side and disappeared over the cliff down to a hidden depth in the canyon. “Whaaaaaat… you’re kidding…” my partner responded with a scowl, but I could tell there was a new optimism in his tone. That night had been extraordinarily refreshing. The great thing about 9 hours of near constant movement is that what follows is 9 hours of deep, exquisite sleep. High up on the ridge overlooking Ape Canyon I had set up my hammock between the two largest trees that I could find, which was difficult considering the sparsity of trees in this region. My partner had set up his tent on a small grassy clearing nearby. Remnants of the previous night’s campfire sat darkly between our two shelters. The Plains of Abraham laid before us – flat and endless; the morning heat already shimmering above the surface creating the mirage of a distant ocean. There was a renewed optimism which arrived on this day. The first day had been challenging, however. After walking 9 hours with only a handful of breaks, we estimated that we had traveled close to 11.75 miles. The failure to reach our intended camp site near Windy Pass meant that additional ground would need to be covered on this day. Not only would we need to hike 3 miles to Windy Pass through the Plains of Abraham, but we would need to traverse the 10 mile section were off-trail excursions and camping were restricted. Furthermore, our intended campsite somewhere between the South Fork Toutle River and Sheep Canyon was an additional 2-3 miles outside of the restricted zone. The Plains of Abraham felt like a gentle walk in the park. The smooth, flat terain was a relaxing stroll in the morning sun. That is until we reached Windy Pass. 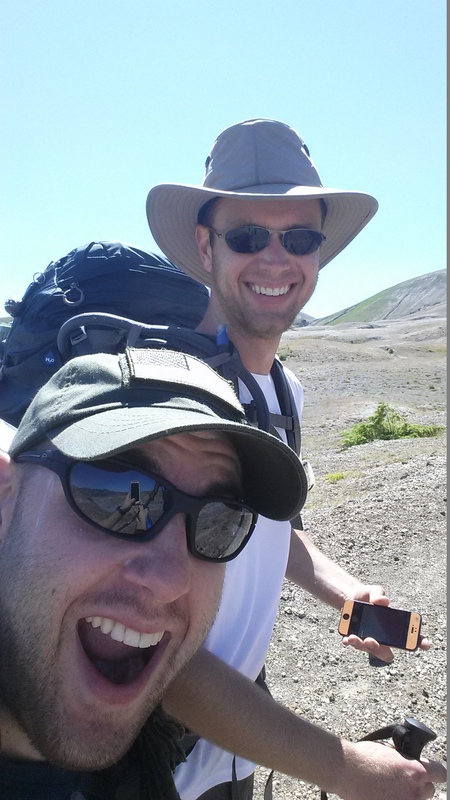 Our muscles ached as we began to climb up the steep, ashy slope toward “no mans” land. It became evident that camping, while possible for those in our party with tents, would have been difficult for a hammock. There were no trees, only piles of ash and rock. 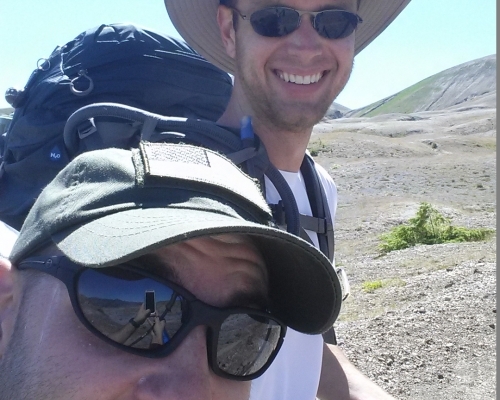 Our ascent continued past an ominous wooden sign warning of the restricted zone and soon we were standing on top of a hill of sand, rock, and ash looking at the northern crater rim of Mt St Helens. Evidence of the destruction that had dumped feet of debris across miles of northern landscape laid before us. In the distance we could see Johnston Observatory. Spirit Lake was located to our immediate northern position. Another seemingly endless expanse of rolling grey hills extended to the west. It looked like a desert full of inhospitable landscape and we knew we had to make our way through it today or risk being stuck in it. The water on the north side of the mountain is drinkable, but it’s highly recommended that you use a filter. A few of the streams that we encountered looked like chocolate milk and this was likely due to the high mineral concentrations. My LifeStraw worked wonders here as, halfway through the restricted zone, my 2-liter backup water supply ran dry and I became solely dependent on refilling my water containers at each water source we discovered. We made it through the flat, 10 mile stretch of “no mans” land at the quickest pace of the entire trip. Incredibly, we covered nearly half of Loowit Trail in a single day. Soon we were seeing vegetation again and had high hopes of finding a campsite next to a running stream. South Fork Toutle River would do, if there were any spots available. However, when we finally reached the part of the trail that descends down to Toutle River we discovered that the canyon it had carved was the largest one that we had encountered on the entire trip. We did it though. After descending down in to the depths of the canyon we found Toutle River and I had never been so thankful to find fresh, running water in my entire life. My level of thirst was approaching “very parched” and I ended up drinking at least a liter and a half when we finally arrived. The tastiest water of the entire trip. At this point I think it’s worthwhile to note that many people point out that Loowit Trail requires some climbing in certain steep sections. In fact, there is a rope that extends down to Toutle River from the north side of the embankment. Total length is probably about 20 or 30 feet. If you have confidence in your arms and legs you can navigate this obstacle with ease. Post-Toutle we encountered many hikers who were hoping to camp near the river. This was disappointing because it meant that most of the camp spots that we had hoped to secure were already occupied. So we pushed on. The trail became very dense with trees and shrubbery, and the grade got steeper as we climbed out of the canyon. If I could post a picture of this it would simply be a block of green. There was no scenic view of the canyon and no indication of when we would be out in the open air again. After several hours of this, our minds began to feel that same hazy exhaustion that had plagued us at the end of the previous day. I began to demand that we find a spot to set up camp but nothing seemed viable. Suddenly though we came open a clearing that showed evidence of previous human activity. Half crazy with exhaustive delirium we set up camp and collapsed in our respective places in the clearing. …Lock your windows, close your doors. Biggie smalls, huh… yeah. “What are you doing?” Cheval asked. I couldn’t tell if it was irritation or incredulity in his voice. “Dude, turn that off. There might be families around,” said a concerned Cheval. “Would you prefer some Metallica?” I inquired innocently. “No! We’re out enjoying the sounds of nature!” he explained, pointing his trekking pole at the impartial trees as if at any moment they might reach out and snap my iPhone in half. “Haters gonna hate,” I reasoned. My battery lasted for another 10 minutes before the 3% that had been remaining was extinguished by the sweet melodies of In Flames. We were on the last leg of our trip. And without the touching lyrics of Marilyn Manson to comfort our aching muscles the route was as peaceful and sublime as any we had come across thus far. In many ways it resembled the southeast side of the mountain with its patchy tree work and sporadic, ice melt, runoff canyons. Strangely, there is no record of day 3 in our combined album of pictures from this trip and I think it speaks to the mindset that we had on this day. Exhaustion is one definition for it, another is the frame of mind one takes when they know they are on the cusp of completing something big; something extraordinary. Our sole purpose for existing that morning was to make a successful return to the trailhead. Yeah, we started listing off all of the delicious foods that we would consume once we were back in civilization. We discussed sleeping for days on end and never coming back to Loowit Trail. But it was all a distraction to keep our minds from counting the miles left until we were home. The final miles of any decently proportioned hike are like this. If you’ve ever been away from home, away from a warm cooked meal, or away from the ones that you love for any extended period of time then you know what I’m talking about.